Dramatic bodycam video shows an Edgewater police officer and a Volusia County Sheriff’s deputy fighting to free a man trapped in a burning vehicle that had just been struck head-on by a wrong-way driver in one of two fatal early-morning crashes Wednesday. “These officers acting courageously and selflessly during this rescue,” said Edgewater Interim Chief of Police Joe Mahoney. Two men were killed Wednesday in a pair of early morning interstate crashes, one of which resulted in a secondary wreck that upended a dump truck, spilling asphalt onto the roadway and closing southbound Interstate 95 for the better part of the day, reported the Florida Highway Patrol. The southbound lanes of I-95 reopened about 1:40 p.m. but had been shut down for several hours between State Road 442 in Edgewater and Deering Parkway in Scottsmoor, causing major delays as vehicles were detoured to U.S. 1. Around 12:45 a.m., authorities responded to reports of a car traveling the wrong direction on I-95 southbound. That car, a 2010 Honda Insight, driven by 23-year-old Devon Standish of Daytona Beach, was traveling north in a southbound lane and crashed head-on into a 2018 Cadillac driven by Logan Aschendorf, 22, of Boca Raton. 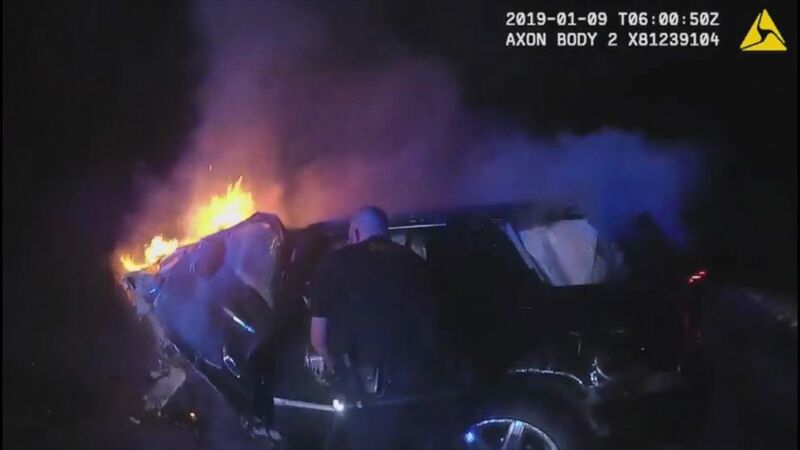 The Cadillac caught on fire, and body cam video provided by Edgewater police shows officers and Volusia County deputies working feverishly to bust in windows and pry open doors to pull Aschedorf to safety. An Edgewater officer who entered the vehicle was treated for smoke inhalation and later released, Mahoney said.